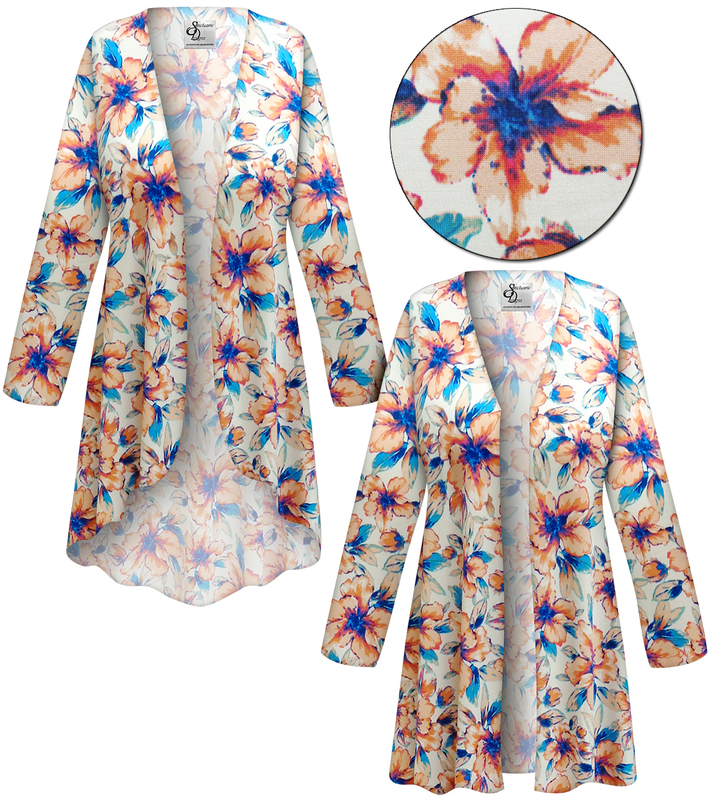 These are fabulous bright and vibrant lightweight stretchy slinky print jackets & dusters. They boast the perfect print for fun & relaxation, and are completely customizable! Sleeves: Long, 3/4, Half, Short, Tank, or to add a bit of elegance or fun, you can get a round bell or poncho style bell! Length: Lengths range from Petite to special order Talls. 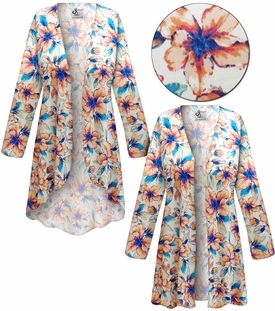 Patterns and colors are only approximate and will vary from piece to piece due to size, computer monitor & dye lots. This fabric is a wonderful lightweight slinky fabric (with lots of stretch) & a breeze to take care of! Throw it in the washer, dryer, and straight into a drawer or suitcase, take it out days or weeks later, and it's ready to wear! Another thing that's great about these slinky fabrics, is they rarely wrinkle, so they travel great! They're very stretchy, and have a wonderful drape! LG: Chest:37" - Hips (appx):50" LG: Chest:34" - Hips (appx):46"
XL: Chest:43" - Hips (appx):56" XL: Chest:40" - Hips (appx):52"
0x: Chest:48" - Hips (appx):58" 0x: Chest:44" - Hips (appx):58"
1x: Chest:52" - Hips (appx):62" 1x: Chest:48" - Hips (appx):62"
2x: Chest:56" - Hips (appx):66" 2x: Chest:52" - Hips (appx):66"
3x: Chest:60" - Hips (appx):70" 3x: Chest:56" - Hips (appx):70"
4x: Chest:64" - Hips (appx):74" 4x: Chest:60" - Hips (appx):74"
5x: Chest:68" - Hips (appx):78" 5x: Chest:64" - Hips (appx):78"
6x: Chest:72" - Hips (appx):82" 6x: Chest:68" - Hips (appx):82"
7x: Chest:76" - Hips (appx):86" 7x: Chest:72" - Hips (appx):86"
8x: Chest:80" - Hips (appx):89" 8x: Chest:76" - Hips (appx):90"
9x: Chest:84" - Hips (appx):92" 9x: Chest:80" - Hips (appx):94"
PLEASE NOTE! This material is very stretchy. However, all measurements are always taken unstretched. Unless specified otherwise, made to order customizable items usually ship within 3-7 working days*. 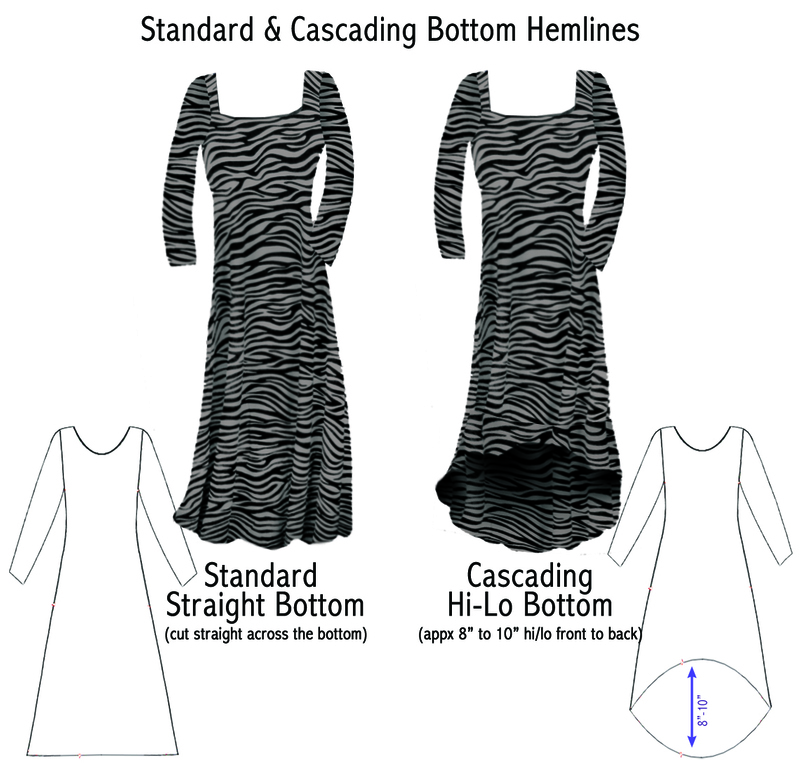 Special orders: Petite or tall lengths, and/or cascading style hems are considered special order, and usually ship within 3-7 working days**. **You can rush to make your item faster in the selection below. This does not include the actual shipping cost, it is just the cost to rush the process of creating the item & rush processing the order. You will have the option to upgrade your shipping at checkout and you can choose your shipping speed at that time. Are you having trouble using our website or placing an order online?